Classic and classy, letter openers make a fine statement as enduring mementos for any special occasion. And when you add an exquisitely designed heart theme you've got a favor that you and your guests can really tear into! 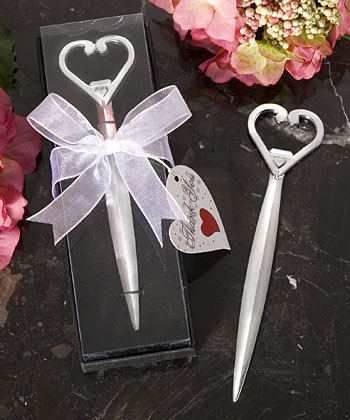 Each 6" x 1.5" x 0.25" letter opener favor is made of sturdy chrome with a stylized heart silhouette at its top. Sure to make a stunning addition to your guests' desks at home or at the office, each comes individually packaged in a deluxe box with a clear top and black base tied with a white organza bow with an attached heart shaped thank you tag.